A United Launch Alliance Atlas 5 rocket rolls out to Space Launch Complex-41 at Cape Canaveral Air Force Station in Florida with the Air Force's third Advanced Extremely High Frequency (AEHF-3) payload, ahead of a planned Sept. 18, 2013 launch. An Atlas 5 rocket, crowned with a secure, jam-resistant U.S. Air Force communications satellite set for liftoff Wednesday (Sept. 18), arrived at a launch pad in Florida on Monday (Sept. 16) after a condensed assembly and test campaign designed to help United Launch Alliance prepare for a bustling manifest over the next year. The 196-foot-tall (60 meters) Atlas 5 rocket rolled out from its Vertical Integration Facility to its launch pad at Complex 41 on Monday, beginning the 1,800-foot (549 m) journey on time at 10 a.m. EDT (1400 GMT) and completing the trek less than an hour later. Liftoff with the Air Force's third Advanced Extremely High Frequency communications satellite is scheduled for 3:04 a.m. EDT(0704 GMT) Wednesday at the opening of a two-hour launch window. The predawn blastoff will mark ULA's 75th launch since it began operations in December 2006 and the 40th mission for an Atlas 5 rocket since August 2002. It's the sixth Atlas 5 mission of 2013. Formed with the merger of the rocket divisions of Boeing Co. and Lockheed Martin Corp., ULA operates the Delta and Atlas rockets lofting payloads into space for the U.S. military and NASA. Boosted by three solid rocket motors and a Russia-built RD-180 main engine, all provided by Aerojet Rocketdyne, the Atlas 5 rocket will race east from Cape Canaveral Air Force Station, crossing the Atlantic Ocean in about 20 minutes after shedding its set of strap-on motors, 16.4-foot (5 m) diameter payload fairing and liquid-fueled first stage. Two firings of the Atlas 5's Centaur upper stage will maneuver the 13,600-pound (6,169 kilograms) AEHF 3 spacecraft into a supersynchronous transfer orbit with a low point of 140 statute miles (225 kilometers), a high point of 31,069 statute miles (50,000 km) and an inclination of 20.9 degrees, according to ULA. Deployment of the AEHF 3 satellite is scheduled about 51 minutes after launch. Check out a launch timeline for details on the rocket's ascent. Manufactured by Lockheed Martin, the AEHF 3 satellite will extend the Air Force's growing network of new-generation communications fleet built to ensure U.S. military forces stay in touch with civilian leadership in the event of nuclear catastrophe. "The AEHF system will be the backbone for protected and reliable secure communications well into the next decade," said Air Force Col. Rod Miller, AEHF program manager. Monday's rollout came 45 days after ULA engineers started putting together the Atlas 5 rocket inside its 30-story vertical hangar. The rocket's shimmering gold first stage was erected on its mobile launch table Aug. 2, then workers added three 67-foot-long (20 m) composite solid rocket boosters. A Centaur upper stage was hoisted atop the Atlas 5 on Aug. 13, and the AEHF 3 satellite, already shrouded inside the rocket's payload fairing, arrived at the launch pad in early September after being prepared and fueled in a nearby processing plant. ULA instituted a streamlined campaign for the AEHF 3 launch, which is known as the AV-041 mission in the parlance of the Atlas program. The hope is to reduce the span between Atlas 5 flights to help ULA keep up with a busy manifest of launches over the next year for the Defense Department and NASA. "The span reduction that we've been working on here in the launch operations locations has really helped us be a little more responsive to our customers," said Mark Dowhan, ULA's vice president of launch operations. "In simple terms, we look at a lot of the end-to-end testing that we perform ... at the production site or the launch site and we look to eliminate some testing that is probably redundant, or unnecessary, and cover it in other locations to streamline the process. That has served us very well." For the first time on a "500-series" Atlas 5 with a 5-meter-diameter payload fairing, engineers opted not to put the launcher through a wet dress rehearsal, a full practice countdown in which the rocket is filled with propellant and exercised to check for any problems. 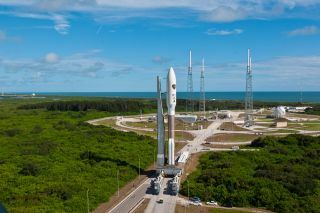 Jessica Rye, a ULA spokesperson, said the change saves six days in the launch campaign for a 500-series Atlas 5 rocket. Workers altered access platforms inside the Atlas 5 integration building to permit workers to more quickly access and resolve problems that could crop up in a launch countdown. "We've compressed the flow of this particular mission," Dowhan told reporters in a prelaunch teleconference. "We shoot for a 10 percent reduction annually in terms of the span for our Atlas and Delta vehicles, and we've been hitting that number." The AEHF 3 launch, previously scheduled for Sept. 25, was moved up a week in August. ULA already deleted the wet dress rehearsal for most missions of the 400-series Atlas 5 featuring a smaller 4-meter nose fairing. Similar time-saving procedures are being introduced for the Delta 4 rocket. "It just provides additional capability," Dowhan said. "Our manifest is increasing. We have 15 launches on the manifest next year between the Cape and Vandenberg [Air Force Base in California], and this will certainly allow us to decrease the spans and get all those missions in for our customers." Follow Spaceflight Now on Facebook and on Twitter at @SpaceflightNow. Copyright 2013 SpaceflightNow.com, all rights reserved.